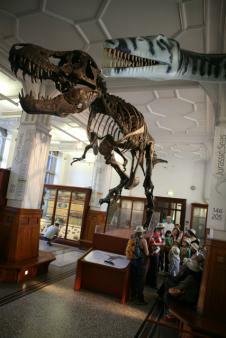 Travel back in time to Ancient Egypt, see reptiles and amphibians from Costa Rica, walk beneath a giant whale skeleton, come face-to-face with a tiger and meet a life-size Tyrannosaurus rex... just a few of the highlights of a visit to Manchester Museum. Our family testers report back. 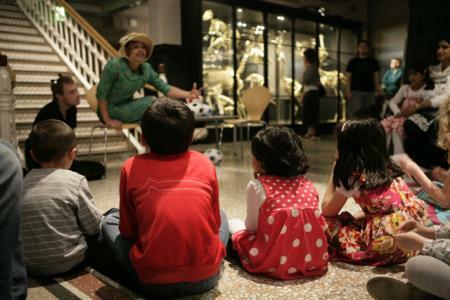 Kellie Ishmael and a friend took four children (aged 2, 5 and 8) to The University of Manchester, Manchester Musuem. I think we saw every corner of the museum and there was a lot to take in! The Zoological Collection is huge, with tigers, polar bear, gorilla and elephants to see. The Egyptology Collection is home to one of the largest and most important collections of ancient Egyptian artefacts in the United Kingdom and it is just amazing. The dinosaur section, or fossil gallery, can be easy to miss as it’s through a courtyard. The fossil gallery takes you on a journey through the evolution of life, from 3500 million years old fossils of Australia, to the early human occupation of Britain at Creswell Crags in Derbyshire. However, the lifts aren’t great and we spent a long time going up and down to get to right section! The museum is in two separate sections so we consulted the map regularly to get the most out of it. We all enjoyed having a wander round seeing the various displays on show, from mini-beasts, birds and elephants and polar bears! One of the most popular of the Museum’s galleries is the Vivarium, home to many species of frogs, reptiles and lizards from South America, Australia and Madagascar. You can even sponsor a frog and get to meet 'your' frog in the Vivarium. Nature Discovery is aimed at 4-7 year olds and designed for younger children and their families to help them explore nature together. Count the rings on a tree that lived for over a thousand years, see creatures that live deep beneath the sea and try moving like an insect... it's all about looking closely, comparing things, sorting things and trying to name them. Coming face to face with a terrific Tyrannosaurus rex, Stan the T. rex (excavated in 1992) is a bit of a visit highlight! The object handling tables and the chance to get hands-on with some of the exhibits. 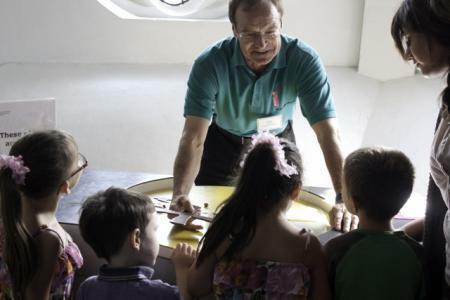 Monthly Big Saturdays and school holiday events offer the opportunity to do everything from meeting scientists to touching a 200-million-year-old fossil and making your own treasures. For under-5s there are Magic Carpet story sessions, as well as sensory play and interactive story sessions for babies who aren't walking yet. Make a keepsake of your visit by printing out and filling in a Manchester Museum Family Scrapbook. There is a café that offers a children’s menu with healthy and fun dishes that are great value for money. There are also high chairs, a baby food station and a dedicated space for pushchairs. There is an indoor picnic area so it is also easy to take a packed lunch. We caught the train to Oxford Road. It’s a 15-minute walk from there and the Museum is easy to find. Buses 85 / 86 / 250 stop at Booth Street West and 41 / 42/ 43 / 111 / 147 at University of Manchester, Oxford Road, or you can park on Booth Street West Car Park D pay and display. 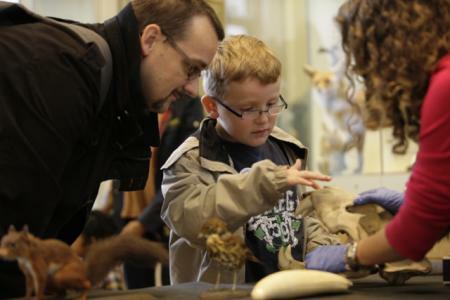 The Manchester Museum is open daily, 10am-5pm (closed: 24th -26th December and 1st January) and entry is free. There is a shop selling a wide range of gifts – you can buy anything from African tribal charms to Roman swords, Egyptian papyri to fossils and includes cheap £1 presents for the kids. Look through an online magazine, Amazing facts at the Manchester Museum, for a close-up view of some of the most interesting exhibits.